I have had many people ask why we bother rhinestoning our dancer’s costumes. I’ve heard comments such as, “It’s not like the judges are going to dock points for not having enough rhinestones on!” While this is true, costumes and showmanship ARE part of what they are scored on at many competitions. 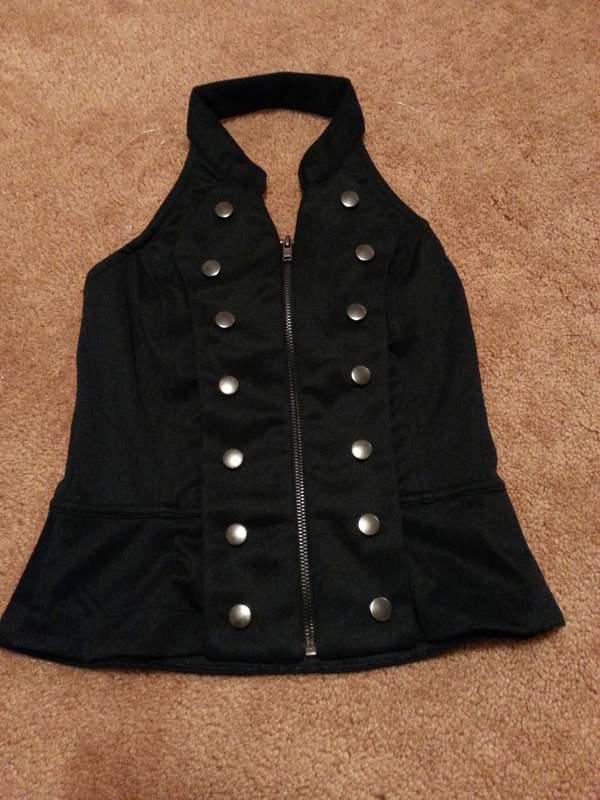 Here is my daughter’s vest for a tap costume as it originally came. Ideally, a costume enhances the theme or message of the piece. On occasion, when a costume doesn’t seem to match the dance or the idea being presented, it can be almost uncomfortable to watch. On the other hand, a costume that fits a piece perfectly, makes it a more enjoyable experience. If you don’t think the shimmer of the rhinestones (or sequins, or glitter) adds to the appeal and pizzazz of a costume, you need to take another look. The impact can be quite noticeable! Let’s take a look at my daughter’s small group costume. Originally, it was a black vest with hot pink jeggings. On its own, it is very cute! It almost looks like something my daughter would wear hanging out with her friends. However, I knew that Miss Maria, owner of Lake Area Dance Center, would find a way to rhinestone it that would make it really pop onstage. I always look forward to seeing what she comes up with. As usual, she didn’t disappoint! The second picture shows how the rhinestones make a difference on the vest. The pink rhinestones on the buttons really make them “pop.” Without them, it might be difficult to see the buttons from a distance. 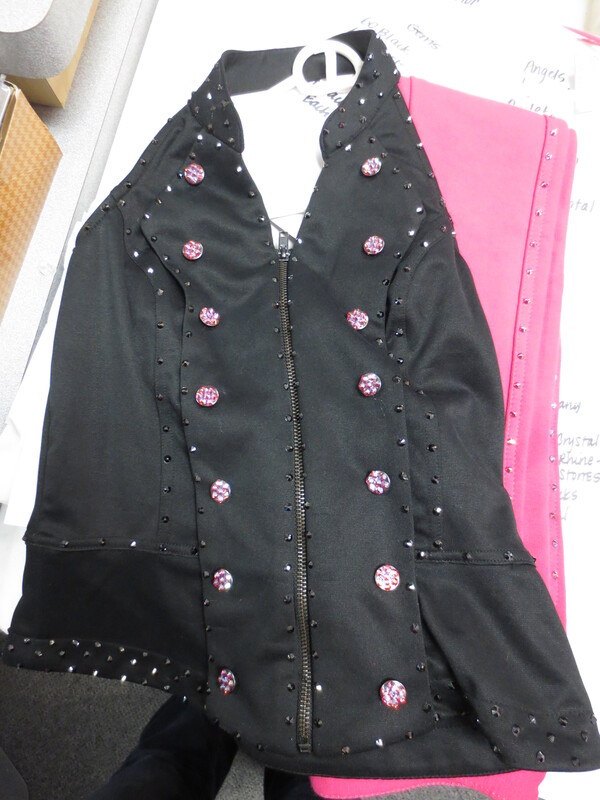 While it may not be the best picture, you can see how the rhinestones enhance the overall look of the vest! In the past, I was skeptical about the purpose of black rhinestones. I have since realized how even the black ones can really catch the light, which adds to the overall effect of the costume. The picture also shows the pink rhinestones down the seam of the jeggings. That also makes a subtle difference in the costume. It makes the lines more noticeable as they are turning in unison, or opposite each other. The smallest details make the differences that people don’t necessarily recognize, but know are there. Recently, my daughter’s small group performed in a local show with this costume. With the stage lighting on, it looked fantastic. Of course, the dance itself is very fun, and they did a great job performing it, but the costumes looked great too! There’s something to be said for stage lighting, and how it shows off both the dancers’ moves and their costumes. Even when they turned on the black lights, you could see the dancers because of the way the rhinestones reflected the light. While it’s not always easy to articulate why rhinestones are important on costumes, most people would probably notice a difference if they saw the same dance done with and without any kind of sparkle added to the costume. My guess, is that most people would enjoy watching the dances with rhinestones, etc. just a little bit more (even if they can’t put their finger on why). 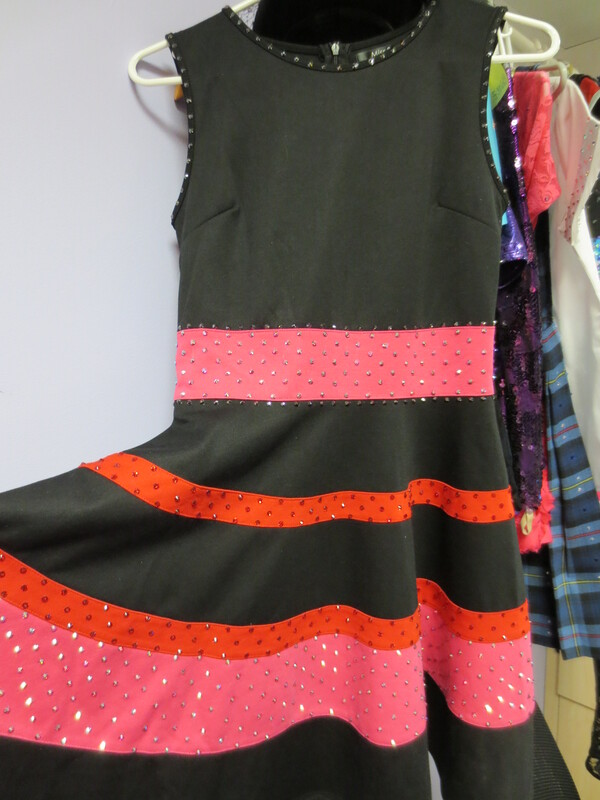 The showmanship and enhanced costume is the little difference that could make a dance stand out. When you are being judged, standing out can be really important (especially if 10% of your score is based on your overall appearance)!